Synopsis : ‘Only losers blame their luck.’ Architect Jai Dubey trusts in reason not in faith and prayers. When fortune deserts Jai and his carefully ordered life spins inexorably out of control, he stands on the brink of ruin. Only a delayed monsoon can save Jai’s biggest project from disaster, but there are millions across the land praying for exact opposite. Reason seems to have its limits- the weather defies all prediction, let alone control. Will Jai relinquish the beliefs of a lifetime? Will he reconcile with the awful ambiguity about his past? Will he be able to save his crumbling marriage? My view : There are books that are written straight from the heart, aimed at your emotions and your engaging heart. Rain is such a book, which has still not been tainted by commercialised writings that we so often see many recent authors penning down. Whenever I read a book, that brings a major change of phase in my life, my emotion is extreme. 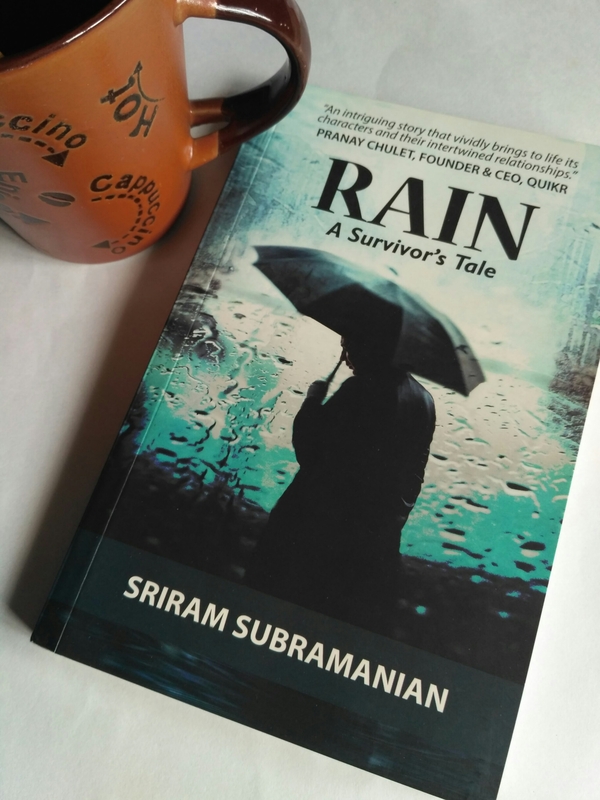 After reading Rain by Sriram Subramanian, I have read 4 other books and to be completely honest, none of them have lived up to it. I don’t remember any of those 4 stories as vividly as I can recall this beautiful tale of a survivor. Rain is a story of conflict of emotions, beliefs and core values. A man who struggles to prove an astrologer wrong, goes out of his ways to achieve a certain target set by scheming circumstances. His battle against superstitious beliefs, his own tormented inner self and the daily ways of life brings forth unseen mishaps into his regular life. As he attempts to scrape through the rainy days of his life, his relationship with his wife is stained. His past that has definite blankness and mystery breaks a taut thread that had kept a hold on him to the social life for so long. The author has a certain way with words that will keep you hooked on to the story in spite of, it not being a racy thriller. His detailed explanation of things that are trivial to an usual eye is something to behold. Being from Kolkata and not having a lot of travel experience, I have hardly any idea if life in any other city. Therefore, when Subramanian’s description of Pune hit me, I was taken to the real setting of the book. His description is realistic and emphasised on details that a newbie in the city would definitely need to know. Since the story was narrated by Jai, an outsider to Maharashtrian community, made it easier for a person, who is not a native, to connect. The characters of the story have been outlined in a unbiased way and we are given a glimpse of each of their perspectives. Sarika’s ambiguous beliefs in science and religious rituals is a mirror to most educated Indians. Mallika’s character is like those lionesses that protectively guard their cubs and would not let any harm come to their children. Ganesh’s jovial nature and quest for scientific mysteries doubles up into a doting father in whose shadow Jai finds some solace. The simple and honest description of Raji and Lakshmi haunted my sensitive self for days. The philosophical conversation at the end of the book was inspirational and will make you ponder about it. However, I think it was short-lived and delayed, which brings me to my only regret about the book. I wish the novel went on for a few more pages. I missed it so much after having finished reading it.